Designed for even the most demanding installations, Super II simply out-performs other in ground swimming pool pumps. Efficient, full-flow hydraulics produce more flow at equivalent horsepower, resulting in lower operating costs. Super II, when you want the very best. With convenient features like a see-through cover so you know exactly when to empty the extra large basket, the Super II Pump by Hayward is built to last and engineered to perform even under the most demanding conditions. 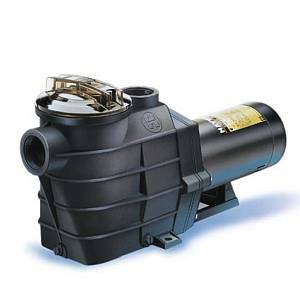 This full-rated and max-rated high-performance pump also features full-flow hydraulics that allow greater flow at al lower cost of operation and a housing design that makes is as quite as it is dependable. Self-priming and a 180 cubic inch basket for extra-leaf holding capacity, the Super II, simply out-performs the competition.